REET GK Notes Rajasthan General Knowledge Questions Set 3 Capsule REET And CTET GK Are going to give you notes on the most important subject of Rajasthan Eligibility And Date Wise 18-10-2017 General Knowledge questions and answers REET Level 1 And Level 2 And important questions and answers, Notes, Syllabus, Answer Key, Related. 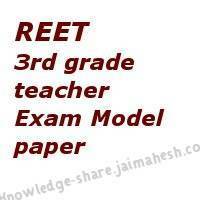 CTET, RTET, REET, HTET and Lecturer, Second Grade Teacher and Third Grade Teacher Exam Related Model Test Paper Notes. Question. (1) It is appropriate to give importance to girl education, because? बालिका शिक्षा को महत्ता देना उचित है, कारण ? (A) किसी सामाजिक परिवर्तन के नेतृत्व में केवल बालिकाएँ समर्थ हैं ? Answer – (A) किसी सामाजिक परिवर्तन के नेतृत्व में केवल बालिकाएँ समर्थ हैं? Question. (2) If a student does not respect you, then you? यदि कोई विद्यार्थी आपका सम्मान नहीं करता है तो आप ? Question. (3) At what level do children become active members of their class? किस स्तर में बच्चे अपने समकक्षी वर्ग के सक्रिय सदस्य बनते हैं ? Question. (4) it possible to be the most in a normal 12 year old child? एक सामान्य 12 वर्ष उम्र के बच्चे में सबसे अधिक होना संभव है ? Question. (5) The most important feature of a student? किसी विद्यार्थी की सबसे महत्वपूर्ण विशेषता है ? Question. (6) it better to teach in mother tongue at the basic level, because this? बुनियादी स्तर पर मातृभाषा में शिक्षा देना बेहतर है, क्योंकि यह ? Question. (7) Should be the aim of education? शिक्षा का उद्देश्य होना चाहिए ? Question. (8) What is the age of toys? खिलौनों की आयु कहा जाता है ? Question. (9) Which childhood is not a prey? कौन-सी पूर्व बाल्यावस्था की विशेषता नहीं है ? Question. (10) In childhood, the child learns to understand the change in the essential element of material things? बाल्यावस्था में बालक भौतिक वस्तुओं के किस आवश्यक तत्व में परिवर्तन समझने लगते हैं ?